Cockroaches are one of the most resilient creatures on the planet. It is said that these disgusting insects will one day inherit the earth. This is because cockroaches can tolerate a surprising amount of radiation before death occurs. But radiation isn't the only thing cockroaches are resistant to. They've obviously found a way to survive the bitter cold winters of Maine. And, for a bug that loves the heat, that is saying something. How do they do it? One way they do it is by getting into man-made structures, where the temperatures are warm all year long. This makes cockroaches a year-round problem in South Portland. Here are some tips that can help prevent a cockroach infestation in every season. When it starts to get cold, cockroaches look for a place to hide. In nature, they will scurry into holes, burrows, caves, crevices, and other locations that provide safety from the bitter cold. In the Urban landscape of South Portland, they get into both homes and businesses. Our fall tips will focus on keeping cockroaches out. Do an inspection of exterior walls and fill in holes, gaps, and cracks. Examine all screens and make sure they are in good working condition. Cover vents and gable openings with window-grade screens. Check and replace and door sweeps and weather stripping that do not make a good connection all the way across. If you're dealing with cockroaches in the winter, it isn't because they crawled across your yard and squeezed in through a crack in your exterior walls. It's too cold in the winter. The only way an infestation is going to occur is if cockroaches hitch a ride in. That will be the focus for our winter tips. When someone comes to visit, they can bring unexpected guests with them. Cockroaches are notorious for hiding in suitcases. If a female cockroach has babies on her ootheca, you could acquire a full-blown infestation. If someone brings furniture and other items into your home or business, there is an even greater chance of a cockroach infestation. When you get a box in the mail, do an inspection for roaches--just in case. Cockroaches are moisture pests. As you are aware, spring in Maine is moist. Some even call it mud season. The focus of our spring tips will be on the control of moisture around your foundation perimeter to make it less interesting to cockroaches. The fewer cockroaches you have near your foundation, the fewer cockroaches you'll have inside. Spring cleaning is more important than you know. If you have leaves, twigs, and other organic material in your yard, you're going to have a lot more moisture in your soil. Cockroaches will thrive in this environment. Roaches will also use objects that are near your foundation walls as harborage. If you keep firewood near your home, consider moving it 20 feet away and elevating it. Spring is an important time to inspect your gutters for breaks caused by icicles or clogs caused by leaves. Both of these can cause water to dampen the ground around your home and lure cockroaches in. Trim trees and bushes to allow sunlight into shaded areas. This will help dry up rainwater. Examine outside spigots, hoses, and plumbing and repair any leaks. Cockroaches are cold-blooded creatures. When it warms up, their bodies are like well-oiled machines. That means they're going to be more active. And, when cockroaches are active, they're usually looking for food. This will be the focus of our summer tip. Trash heaps, dumpsters, and open trash cans are a strong attractant for cockroaches. The smells of rotting organic matter will lure cockroaches in from quite a distance. Periodically clean trash receptacles and make sure trash is removed from the premises weekly. If you have compost, be sure to keep it well away from your exterior walls. Remove any conditions that allow rotting organic matter to be in your yard. 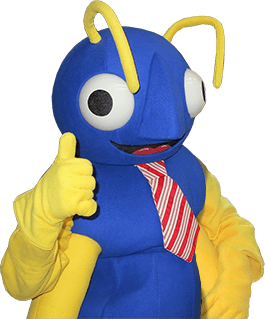 If you need assistance preventing a cockroach infestation in your South Portland home or business, or you need cockroaches exterminated, reach out to Big Blue Bug Solutions. Our team uses industry-leading pest control products and methods to help our customers become bug-free and stay bug-free. For residential or commercial pest control in Southern Maine, start here.